Vancouver Personal Injury Lawyers for ICBC Injury Claims Settlements for MVA Car Accidents and Catastrophic Injuries Needing Fair Costs of Future Care & Pain & Suffering Compensation - CLICK ON BLUE TEXT UNDER PHOTOS FOR Lawyers Info. Contact a lawyer about your injuries BEFORE talking or meeting with ICBC ! Personal Injury Lawyers will give you a free initial consultation. Know your compensation rights and legal options ! · Spine, Quadriplegia, Paraplegia etc. Downtown 1486 West Hastings St. 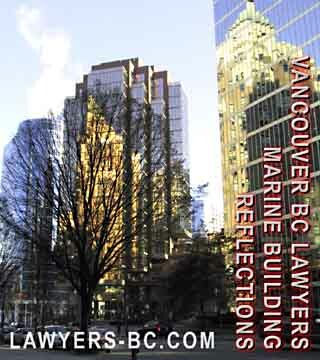 Downtown #670 - 355 Burrard St.
A trial lawyer since 1982, he has experience with all aspects of motor vehicle and I.C.B.C. cases and he deals personally with his clients to ensure the best possible outcome for their claims. He is also well known for his work in consumer and products liability class actions. Over 30 years experience as trial lawyer for Personal Injury and ICBC Car MVA Accident Claims Disputes Settlements. Sandra only represents plaintiff's cases. In other words she never works for ICBC. Sandra has regularly appeared at the British Columbia Court of Appeal, the British Columbia Supreme Court, labour arbitrations, the British Columbia Labour Board, and the Human Rights Tribunal. She has also appeared before the Quebec Court of Appeal, the Quebec Superior Court and the Manitoba Queen's Bench. 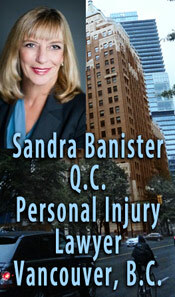 see BanisterLaw.com/sandra-banister-qc/ for more info. see also www.braininjury.claims website for introduction to brain injury claims in B.C. 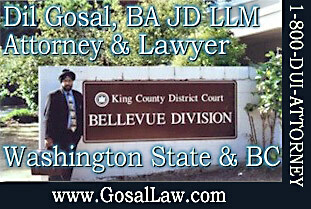 Dil SINGH GOSAL, B.A., LLM, J.D. · DUI impaired driving, dangerous driving, & criminal negligence driving charges in BC & Washington State. Fair settlements are no accident . Get the representation you deserve. S-T-O-P!! STOP!! before engaging the slick professionals at the ICBC Claim Centre. I offer a FREE 30-minute initial consultation for ICBC injury claims where you are a passenger or otherwise not at fault. This is the only exception to my Consultation Fee. We have recovered over $1,000,000 for our clients from ICBC insured Defendants. * The Insurance Bureau of Canada found that injured people with lawyers received over three times more in settlement dollars than claimants without lawyers! Yup: 3 X. ICBC's internal memos I have seen in litigation confirm this. Having a lawyer will help you get what you justly deserve. I represent you and act on your behalf, not ICBC. Legal training includes a Master of Laws Degree fr. New York State University. Read article written by BC lawyers: "The Steps in a Personal Injury Case"
Read article by Rose Keith "Making your ICBC Claim for Personal Injuries Suffered from a Motor Vehicle Accident in BC"
"... Greg Calder has practised exclusively in the area of civil litigation, initially acting for the insurer. 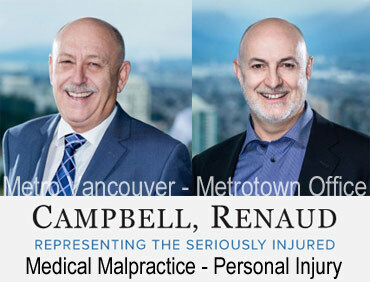 Since 1986 he has acted only for the injured and has represented people from all walks of life from all over British Columbia and other parts of the world. He has handled claims involving brain injury, death, amputations, paralysis, fractures and soft tissue injuries arising from a wide variety of circumstances such as swimming pool accidents, car crashes, falling objects, assaults, professional negligence, skiing accidents, slips and falls and injuries that have occurred as a result of faulty products. Law firm experienced in helping clients suffering from brain damage, spinal cord injuries, amputations, chronic pain and fibromyalgia, fractures, soft tissue injuries.
" Ian's particular areas of interest and expertise are ICBC claims, personal injury claims, estate litigation and other litigated claims." 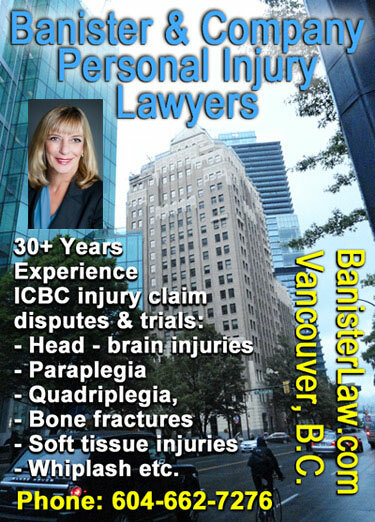 316 - 2800 1st Ave. E.
Over 30 years experience as trial lawyer for ICBC MVA Claims and Personal Injury Claims. SANDRA ONLY REPRESENTS PLAINTIFF'S CASES. 38 Years experience representing injured motor vehicle claimants to achieve full and fair recovery for their personal injuries from ICBC. Experience with traumatic brain injury · soft tissue and spinal cord injuries of all degrees · wage loss and loss of earning capacity. Served as an Assistant Professor for 3 years at the UBC Faculty of Law in early legal career. Received his LL.B. from U.B.C. and a LL.M. from the London School of Economics and Political Studies in U.K.
Edward E. Bowes Personal Law Corp.
Suite 302 -- 543 Granville St.
5th Flr. 555 Georgia St. W.
610 - 6081 No 3 Rd. "...helping injured people and their families with the complex legal and rehabilitation problems associated with brain and spinal cord injury." Work on a contingency fee basis, they get an agreed upon percentage of the settlement, only when the case is settled. Brings over 30 years experience in getting clients a fair settlement for their catastrophic injuries suffered in motor vehicle (car, motorbikes, scooters) accidents. To serve clients whose English is a second language, that is to say their mother tongue is Armenian or Russian - we have an experienced paralelgal staff who can assist in these languages. Z. PHILIP WISEMAN, B.A., J.D. For more than twenty-five years, Vancouver personal injury lawyer Z. Philip Wiseman has been helping clients get the compensation they deserve. Phil Wiseman and his team have the experience to help you. We offer services in many languages, including English, Cantonese, Mandarin, Polish, Vietnamese, and Korean. "Making your ICBC Claim for Personal Injuries Suffered from a Motor Vehicle Accident in BC"
38 Years experience with ICBC injury claims - representing claimants to achieve full and fair recovery for their personal injuries. Served as an Assistant Professor of Law for 3 years at the UBC Faculty of Law in early legal career. Received his LL.B. from U.B.C. and his LL.M. from the London School of Economics and Political Science at University of London, U.K. If you are seeking an experienced lawyer www.LearnZenk.com. Gordon Zenk, senior personal injury laywer, also speaks German and in combination with over 20 years experience serving clients first through his Burnaby offices and now from his Port Moody offices, provides Metro Vancouver clients a range of services from ICBC injury claims disuptes and family law services. · In a motor vehicle accident? · In a public place, such as a store or mall? If you are injured and your symptoms are continuing, you may want to consider legal action against the person at fault. We can help you decide when and whom to sue. But don't delay! In many cases you only have 2 years to start an action. "I've handled all kinds of cases, from whiplash to brain injury. For 20 years I've worked hard to ensure our clients were treated fairly"
"... a personal injury lawyer since 1992. Jeff has conducted trials at all levels of court in British Columbia and has handled the full range of auto injury claims from whiplash cases to amputations, paraplegia and catastrophic brain injury. Jeff is passionate about his work and has earned a reputation for obtaining large awards on behalf of his clients (during 2006-2007 Jeff settled three cases where the awards were in excess of $1,000,000*). "